The Nebelung is one of the newest cat breeds and is still relatively rare. Their beautiful, medium long blue coat combine with a shy but very loving personality. They are indeed creatures of the mist. The Nebelung is a medium sized cat, ranging anywhere from 9 to 15 pounds in size. They have moderate sized bone with a long body. They are not rangy in the way that many oriental breeds are but they are also not cobby in the body. They are elegant, graceful and regal in bearing. They have long legs and tail. The latter must be longer than the length of the body. The head is a modified wedge that sits atop a long, graceful neck. It is more pointed than round although the long fur may make it appear more rounded than it is. The ears are large and pointed, set as a continuation of the skull’s wedge shape. The eyes are oval in shape, on the large side and wide set on the face. They are ideally a deep green but in young kittens, there may still be traces of yellow. By eight months of age though a green ring should be visible. The muzzle is of moderate length and has prominent, puffy whisker pads. This can create a pouty expression on female faces. The pigment on the nose is charcoal gray. The coat is what separates the Nebelung from the Russian Blue. It is medium long in length with a thick undercoat. It requires regular brushing to prevent matting and tangles. The outer coat is soft and silky and tipped in silver, giving the cat the appearance of a silver halo. It increases in length as you move from the shoulders back to the tail. Males may have a ruff. Both sexes have pantaloons and long, thick plumy tail. Like the Russian Blue, Nebelungs are always blue in a solid pattern. The Nebelung originated with opera lover Cora Cobb in Colorado in the 1980s. Her son bred a litter out of his short coated black female, Elsa. There had been long haired kittens in Elsa’s litter so they knew she carried the gene for it as it is a recessive trait. Elsa chose to mate with a short coated, silver blue tom that resembled a Russian Blue. In her litter, there was one long coated blue male and several short coated siblings. Cora took the male and named him Siegfried after a character in Richard Wagner’s the Ring Cycle operas. As Siegfried grew, he became increasingly beautiful and Cora treasured the devoted cat who loved her but was shy with strangers. When Elsa had a second litter with the silver blue tom, Cora took a longhaired female and named her Brunhilde after the same opera. Brunhilde and Siegfried had a litter of their own after Cobb moved to Texas with them and all three kittens were longhaired blue cats. Cobb became interested in starting a new breed that would recreate the longhaired blue cats found in Russia during Victorian times. On the advice of Dr. Pflueger, a geneticist with The International Cat Association (TICA), she drafted a breed standard that was almost identical to that of the Russian Blue except for the coat length and texture. She was also advised to expand the gene pool with the suggestion being made to use Russian Blues as an outcross. She also needed to name her new breed. She considered the name Nibelung from the same operas but the Nibelung were nasty little creatures and her cats were anything but. She then decided to change a single letter, changing to from Nibelung to Nebelung. The latter means “creature of the mist” in German and seemed appropriate given the cat’s unique appearance, silver halo, and quiet demeanor. In the time since their inception, similar cats have been found in Russia and imported to North America as well. Although they are fairly new, thus far the Nebelung seems to have inherited the Russian Blues hearty disposition. They are healthy, long lived cats. Like the Russian Blue, there are no breed specific diseases known to occur specifically in the Nebelung. Bladder stones do occur in Russian Blues at a slightly higher frequency so feeding a good diet of the correct pH is important. Nebelungs do have quite the appetite too so you will need to keep an eye on their weight. Obesity has been linked to a number of diseases in cats, especially diabetes, coronary issues and respiratory problems. It can also complicate surgery and make recovery more difficult. The Nebelung is a quiet companion. Devoted and loving but not particularly outgoing with strangers. In fact, they will disappear when strangers visit. This is a breed that likes to enjoy the quiet pleasure with you. They love to be petted and curl up on your lap or watch the goings on from a nearby cushion. They will follow you from room to room just to remain close by. They are playful and will gladly engage in games with their owners. They enjoy the company of similar minded cats but will not be happy if paired with a rambunctious cat that is overly active. While they can be good family pets, homes with young children will find they tend to disappear in the kids presence. They prefer low key activities to raucous play. They also prefer routine. Homes that are chaotic will not be a good fit for the Nebelung. Although this may make it seem like they prefer to be alone, that isn’t true. They are ideal choices for seniors, retirees, and people who are home much of the time as they are very devoted to their family. If they must be left alone for extended periods of time they will do better with another quiet, reserved cat to pass the time with. Because of their reserved nature, it is important to get a Nebelung kitten from a breeder that raises them underfoot and handles them frequently. If at all possible, watch the breeder interact with the kittens. When you bring your new pet home it is important to let the cat approach you on his own. Let them adjust and get comfortable in their new surroundings at their own speed. About 2-1/2 years ago, a small, gray kitten appeared on our front porch. We fed him, and he started hanging out with our gray female cat. It took two months for my son and I to be able to pet him, and pick him up. Since then, he has bonded with us, and shows all the signs of being a Nebelung. Unless he is a mutant, I can’t imagine where he came from. There don’t seem to be any Nebelung breeders in Ohio. We call him Earl Grey. His eyes are starting to turn from yellow to green. 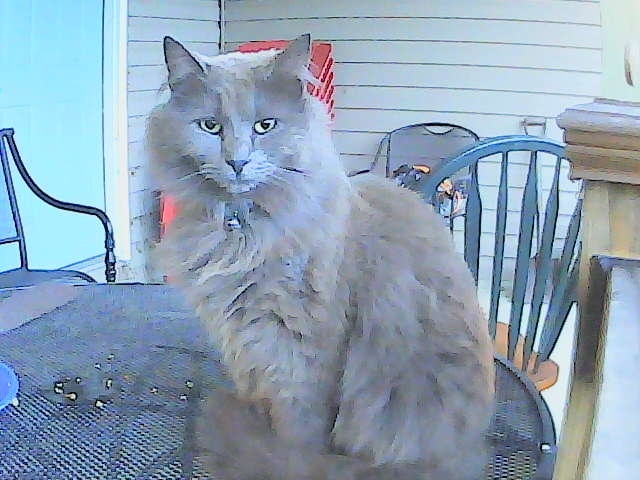 I have a pure bred Nebelung. She is absolutely everything you say she is in this article. She follows me around the house like a puppy and acts more like a puppy than a cat. She comes when I call her and jumps on my lap when I’m sitting in my favorite chair watching T.V. She curls up in bed with me every night and knows exactly what the word “treat” means. I call her “Smokie” because what else do you call a smokie grey-blue cat? She also does not share her favorite spot on the couch. I had a friend visit once and he sat in her spot on the couch. When Smokie saw it, she walked up to him, sat in front of him and stared up at him for a few minutes. When he didn’t move, she jumped up on the couch beside him and stared at him some more. Finally he got the hint and got up and moved to the other end of the couch. Smokie then lay down in her “seat” and indignantly looked over at him as if to say “I’m glad you finally got the hint and got out of my spot”. It was so funny and you had to see it to believe it. Absolutely hillarious!!! You can see her staring at me from the bottom right hand corner of my Avatar if you enlarge it on my Facebook page. I took this photo when she was tapping me on the shoulder to get my attention.